The UN Human Rights Office and many European countries have slammed Israel’s decision to demolish a small Bedouin village in the occupied West Bank. Activists claim Israel wants to use the land to expand settlements. Israeli authorities have moved three bulldozers to Khan al-Ahmar, a Bedouin herding village in the West Bank, following a court’s ruling that declared the settlement illegal under Israeli law. The military already left a land confiscation notice there on Tuesday, local media reported. Protests erupted at the village on Wednesday, descending into clashes with Israeli police. Two people were arrested and over 30 were injured, according to a Palestinian ambulance service. 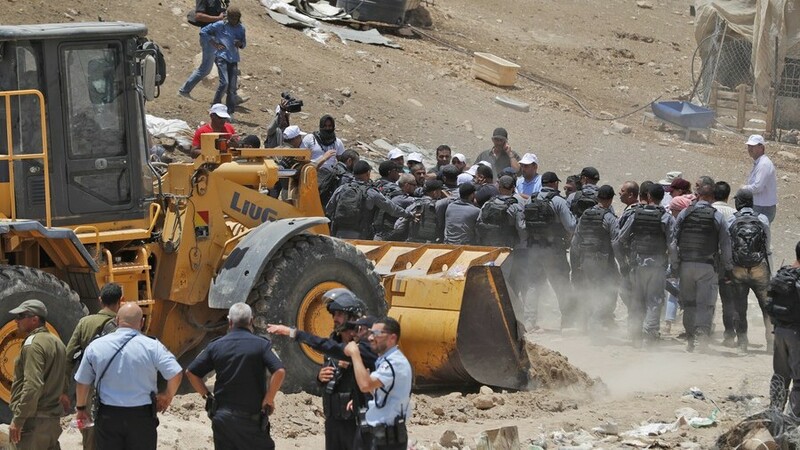 The French Foreign Ministry asserted that bulldozing Khan al-Akhram, which is located in an area “essential for the continuity of a future Palestinian state,” goes against international humanitarian law. Its statement has also accused Israel of undermining peace prospects for Palestine. Jamie McGoldrick, the UN Development and Humanitarian Coordinator in Palestine, had also called upon Tel Aviv to reverse the demolition. Sarit Michaeli, an international advocacy officer with B'Tselem, uploaded images of Khan al-Ahmar bracing for the demolition. “This is what a war crime looks like,” she tweeted. Rights groups say that without the Bedouin village, there will be a bigger settlement pocket near Jerusalem. While Khan al-Ahmar is a small, impoverished settlement of some 180 people – the only school there was literally built from discarded tires – its significance is strategic. Israel is planning to construct a belt of Jewish settlements around Jerusalem in so-called Area C, the major part of West Bank which it completely controls and administers, and Khan al-Ahmar is a likely building site.